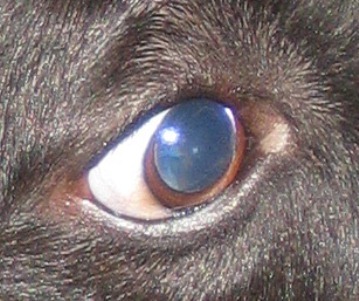 King (3 years old) as far back as I can remember has had a tiny area (1/8 inch) on the exterior of his eyelid near the tear duct area where he lacks the normal black pigment. It is not raised nor does it cause any irritation. It almost looks like he has a small eye "boogar" that you want to wipe off (about 1/8 an inch). He sees the vet on a regular basis (annually for exams and normal vaccinations including about a month ago) and they have never said anything about it (note that I haven't specifically pointed it out but it is obviously there). He has gotten to be a big boy (65 lbs) and it seems like it hasn't changed and is fairly static. I looked at some pictures we took of him from last year at Christmas and one shows it very clearly. My wife brought it up the other day and I told her that it was nothing to worry about and that it doesn't merit a special vet visit. I have read that it may be caused by vaccinations and there really isn't anything you can do about it. He is not a show dog or anything but I have also read that show dogs sometimes get tattooed to cover of these types of eyelid abnormalities. I have no interest in doing that for King. He doesn't care and neither do it. Any thoughts? I can send you a very clear picture but didn't see a way to do it on this initial inquiry. I'd love to see a picture of this issue with King. You can send it to photos@askavetquestion.com. I just sent you two pictures to the noted address. Now, keep in mind that I can't give you a diagnosis over the internet. Obviously a photo is nowhere near as good as an in person visit with your vet. However, I can tell you that this really doesn't look like anything to worry about. I don't think this has anything to do with vaccinations. It's possible that when he was really young he had an injury here that caused a loss of pigment. Whatever the cause though, it's very unlikely to be anything to worry about. There really is no medical condition that could cause the pigment around his eye to look like that. Please tell King that he is a very handsome boy! Thank you so much. I have always thought that it was something like you mentioned. He will very much appreciate the comments about his good looks!